With each time you get gain a level, you will also receive an additional talent point, which you can spend on 1 of 10 unique attributes to upgrade your character. To choose talents you must open the talent window in-game by going to 'Actions', then select 'Talents'. Alternatively, you can simply use the key combination [CTRL] + [T]. 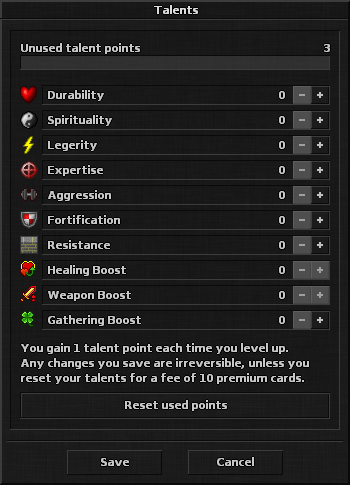 After opening the talent window, you can select increments on any of your chosen talents.